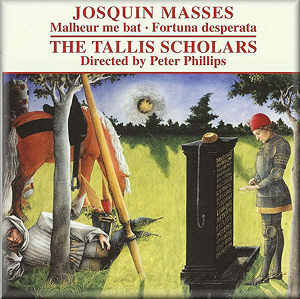 The reputation of The Tallis Scholars under Peter Phillips in this repertoire, Renaissance choral polyphony, is so well established that it hardly needs a gloss. Formed in 1973 and usually performing two to a part, the specialist ensemble has an approach that usually suggests a purity and integrity of sound. They aim for a cleanliness of line and texture and for penetration to the words through focused, uncluttered articulation of the music. Yet this style has not won universal praise; by some it's seen as too anodyne. It's thus important to guard at best against sameness; at worst against sterility. Three aspects of the ensemble's work stop these charges from sticking, and are evident in this excellent CD: the continuing interests of members of the group in scholarly research; their determination to explore dissimilarities across the music of the composers they perform as closely as similarities; and the repertoire itself. If its spirit is fully entered into, the music of Josquin exudes its own vitality. That's definitely the case here. Joy, wisdom, temperance and exultation are all in evidence. Phillips' essay in the accompanying booklet (which also has the Latin, English, French and German texts) may give us a clue to something in the present recording which has afforded it such life. He alludes to the current fashion of comparing Josquin to Beethoven. Of seeing the former also as a hugely influential composer promoting immense changes in the way music was conceived and performed. And of the production of an easily-knowable corpus of profound masterpieces. Specifically, each of Josquin's 16 or so authenticated masses touches on a different area of (human and/or divine) experience; and stands in its own right for so doing. The two masses here presented are works of real wonder, are typical of Josquin at the height of his powers, and are sung with a spirit, a flare and an engagement that make this recording one to rush out and buy: there is only really one competitor to each - The Clerks' Group (Gaudeamus 306, Missa Malheur me bat; Gaudeamus 220 Missa Fortuna desperata). As is common for this kind of composition, each mass has as its model a secular polyphonic song. Malheur me bat, once thought to be by Ockeghem is actually by an obscure Flemish composer, Malcort; while Fortuna desperata (thought to be the earlier) is by Antoine Busnoys. What was not so common was Josquin's recourse to all three voices of each song for the material on which to base his masses. These masses, then, are in the tradition of the later 'Parody masses' of Josquin, his contemporaries and successors. And indeed there is a freshness, a sense of experiment - of adventure, almost - in the singing of The Tallis Scholars… listen to the turns and twists of the Credo in the Missa Malheur me bat [tr.3], for example. It's in the Credo of the Missa Fortuna desperata [tr.8] that one has a good opportunity to hear the melody of the chanson; given the intricacy of the reworking of the melodies' substance, such obscurity is unlikely to yield its secrets without a score. Much of the basis is mathematical. For many listeners, though, this will scarcely matter. We have an outstandingly beautiful sound, polished, without being perfected, by Phillips and the Scholars, and the success of which derives from intimate knowledge of the conventions, practices and deviations thereof, not to mention the place in history which such developments took. They also have the necessary musicianship to negotiate all such complexities. Even these skills would not be enough if such insight resulted only in a mechanical exposition of the relationship of chanson to mass, or a completely empirical rendering of the gorgeous textures of the latter. Instead what Phillips and The Tallis Scholars have achieved on this CD, it's tempting to say, is nod in the direction of the suggestion that Josquin strove for a through-composed work of what we could now call symphonic proportions. Phillips also clearly believes that it's also through attention to structure - again in a symphonic context - that the music works. Even if subconsciously. The components - in this case chanson, paraphrase and the Ordinary - combine into something both ethereal and of great power; both pleasing and challenging to the ear. It needs singers like these to make the amalgam. The Tallis Scholars - supported by Gimell's usual high production standards - have succeeded.